Eurogenes Blog: Unadmixed Basal Eurasians lived throughout the Near East ~45-15 KYA? Unadmixed Basal Eurasians lived throughout the Near East ~45-15 KYA? Below is a map from a recent review paper at Trends in Genetics by Melinda A. Yang and Qiaomei Fu titled Insights into Modern Human Prehistory Using Ancient Genomes. It's somewhat speculative and an abstract of geographic realities (note that the ancient "Karelia" population is placed several thousand miles east of Karelia, in Northern Asia as opposed to Northeastern Europe). Nevertheless, the fact that the authors chose to illustrate the home of the so called Basal Eurasians as a rather large range in the middle of the Near East, rather than something more remote and limited, like, say, a small part of the Arabian Peninsula or even North Africa, is interesting. Indeed, they seem to suggest that post-Basal Eurasian Near Eastern populations took shape not as a result of the expansion of Basal Eurasians across the Near East, but rather due the migration of northern foragers (labeled EUR on the map) from Eastern Europe to the Near East. Like I say, no doubt this is based on some guesswork, and needs to be confirmed with more sampling from the ancient Near East, but still noteworthy that it made it onto the map. Finally, a direct answer to the question of who Mal'ta is more related to, Europeans or Modern Asians. "First, sampling of Siberian individuals from ∼24–17 ka from the Lake Baikal region (i.e., Mal’ta 1 and Afontova Gora 3) showed that they share a stronger connection to Europeans than to Asians, but that they share the strongest connection to Native Americans"
It makes sense, as the Eurasian groups must have been quite diverged before the known admixture events, and all of the groups involved lived in different locations bordering the region on the map, and had very little interaction otherwise. So there must have been multiple distinct Basal Eurasian populations, all in the vicinity of the Near East, around 15,000 years ago. Whether they just moved in from North or Northeast Africa, or had already been in the Near East for 30,000 years already? Anyone's guess at this point. Thanks for this David, another excellent post on your part. So this would be a handy explanation for how Barcin, for example, got all of that WHG? Uniparental markers never favoired the idea that BE came from Arabia or yet alone from North Africa. One needs to extrapolate the existing data about y dna G, J, T, L, E-m35 to understand that BE was in central parts of Near East since very long time. Yes Anatolia was probably the most BE less place in Near East. Btw BE is as distant from SSA than Goyet and Tinyuan. So it could emerge anywhere in Eurasia but it happened that it emerged in West Asia. So Villabruna has some EAS? And who carried that EAS to Europe? Kind of a blunt question, but given the size of BE's territory in this scheme, would you say that this could tell us anything new about the relationship between the Anatolian and Iranian neolithic samples? No more than my working qpGraph topology for ancient Eurasia, I guess? In so far as that all Basal Eurasians were fairly closely related, and what really separates the Anatolian and the Iranian farmers is a lot of input from pWHG into the former. "In so far as that all Basal Eurasians were fairly closely related, and what really separates the Anatolian and the Iranian farmers is a lot of input from pWHG into the former." This more or less answers my question, thanks. I've had some difficulty understanding the specifics of the Anatolian/Iranian neolithic divide. Fascinating stuff. Yeah, they don't really know of course. Davidski: Indeed, they seem to suggest that post-Basal Eurasian Near Eastern populations took shape not as a result of the expansion of Basal Eurasians across the Near East, but rather due the migration of northern foragers (labeled EUR on the map) from Eastern Europe to the Near East. Assuming their model, I suppose there are reasons to think that the European forager populations may have moved around a bit more - glaciation. The European forager zone (just as a quick term for the non-ME West Eurasian zone, without too much thought) is the kind of place that is going to be frequently hit by population crashes due to glaciation, and as climate changes, that will motivate people to migrate (the climate refugees of pre-history?). That may not have been such a salient pressure in the south, and where it was, they surely are not going to migrate north when it happens. The substrate of Palaeolithic Caucasus and Anatolia was UHG (loosely defined). Basal then encoaches upon this Epi Gravettian and Post Aurignacian (resp.) base after the LGM. It's really a mystery how things went during the UP, and it will be until we get samples from more southern regions. But with the data we have, I'm not so sure about that model of southward migration. We have many (20 or more) samples from North Eurasia pre-LGM. Looking at the western part (Europe), we have especially many samples from across the continent and long time span. In that model (that Matt has elaborated about), we would see that those pre-LGM Europeans would have gone south and mixed with Basal Eurasians. But we don't really see that. It looks more like those populations basically went extinct when the LGM came (small exception of those Magdalenians that survived a little longer). And then we see a new population (WHG) colonizing Europe. From where? Not from Europe itself (since we have preceding samples from across the continent) and not from Siberia (we have samples too). Looking at the eastern part of North Eurasia, we have MA-1 already there before the LGM. In that model of southward migration during cold phases, we could imagine that East Asians (mostly in China) would be a mix of whatever basal East Asian and ANE. But again we don't really see this. Chinese have noise levels of ANE admixture. But Siberians have some 80-90% admixture from East Asians. So unless further samples really turn this around, it seems to me that migrations have clearly gone south to north. Or is there a different way of looking at the data already available? From Eastern Europe and Western Siberia. And the mtDNA phylogeny can be interpreted to show an upper palaeolithic migration of mtDNA U from the north to the south and a the migration of mtDNA K from Southeast Europe to Anatolia and Near East maybe just around the glacial maximum. Is that a typo or does Natufian have more BE than HOTU? Yes, some influence of Paleo Europeans in Anatolia to form WHG proper (from UHG) is possible. We have pre-LGM samples from European Russia (near Ukraine), Romania, West Siberia/Central Asia (Altai)... Not really WHG or UHG. I speculate the Predynastic to Middle Kingdom Egyptians were a largely Basal Eurasian with a ruling caste of Neolithic Iranians. Fitting in line with the Dynastic Race Theory. Kostenki and Sunghir were autosomally very similar and they carried similar haplogroups. Kostenki site is close to the Ukrainian border, but Sunghir is further north in the Vladimir Oblast, east of Moscow. Sounds like that talk was based on modern-day DNA though. So unless they have ancient DNA to back up their conclusions, then nothing's certain. "So unless further samples really turn this around, it seems to me that migrations have clearly gone south to north. Or is there a different way of looking at the data already available?" We entirely miss an important sample form Ice Age Europa: Solutreans. Also, the Red Lady el Miron carried part WHG *and* showed that mysterious affinity. She also lived almost during the LGM. She doesn't have any Basal admixture. So you suggest an WHG like population migrated north *during* LGM? Why? That "mysterious affinity" being that affinity to Middle-Easterners. Mind you, D-stat show that it is an affinity to Natufians, to Anatolian Neolithics, to Iran Chalcolithic but hardly to Iranian neolithic. That is about what Fu et al has with Iraqi_Jew. Yes, exactly, El Miron is the earliest sample that has some WHG admixture (~30%?). So it means that WHG entered Europe somewhere around 25-22 Kya? Why would WHG have such affinity to Natufians, Levant_N and Anatolians? Natufians are some ~50% WHG-like (UHG?). I don't think it's because WHG came from Siberia or Eastern Europe (those are about the only places we can exclude, since we have samples, in fact). But if you elaborate on how would you interpret the data available, I'm interested in any idea that makes sense. Consider Kostenki14, GoyetQ116 and Oase1. They are highly different, even if K14 and GoyetQ116 are clearly from the same stock while Oase1 isn't. This might give an indication that ice age people were highly diverse. Also consider that Magdalenians were partly GoyetQ116. That means that a group of people can "disappear" for 15.000 year from the samples, even if that isn't the case. And they were in the right spot at the right time to provide the admixture. The relation to the Natufians is unclear. To an amateur such as me it looks old - No Y-DNA I/mtDNA U5 there. Israeli archaeologist Ofer Bar-Yosef once stated that the Levantine Aurignac seems very related to the South of France but is dated *later* than it. Could the spread of mtDNA U6 be related? If we consider such an old link as I do we are relieved of the question where Y-DNA I would be, as it's expansion in paleolithic Europe could be situated much later. Mind you, this is all highly speculative. "Solutreans are just going to be something between the Aurignacian and grevattian trees; so they won’t change anything "
Always interesting to read about Basal Eurasians, even if it's just a review article. I'd bet we are looking at a representative of the so called "UHG" here. The skull at the top is from Nahal Ein Gev I (27-25 ky BP), a female specimen from the same anthropological cluster. "From the anthropological perspective, therefore, there is no clear association between the late Mousterian/Initial Upper Palaeolithic periods (Manot) human populations and later (<30 ka) Upper Palaeolithic populations in the Levant (e.g. Qafzeh). The former is associated with early Upper Palaeolithic central European populations (e.g. Mladec) bearing many archaic traits, whereas the later are more of the Cro-Magnon type. This may imply population movements in and out of the southern Levant from/to western Asia, Europe, and Africa during the Upper Palaeolithic." Seems to me that Basal Eurasian admixture into the Levant is not older than the Kebaran, which is also why Natufians show such heterogeneity. Similar, but less significant morphological differences are observed in the Iran Hotu specimens. A mixture of cold and warm adapted people, some leaning more towards the one or the other. Admixture events that hadn't had the time to produce homogenous blends at that point in time. That could indeed be the case. Than what we call WHG is basically a mixture between Aurignacian and Gravettian and the difference between Magdalenian en Epigravettian is merely the ratio. Considering that the Ahmerian is sometimes associated with the Gravettian and was contemporary to the Levantine Aurignacian, IIRC, than the WHG admixture in Natufians should be more or less an accidental similar ratio. OTOH the Solutrean is a really different culture if I understood everything I read correctly. Do you if there was a link between Solutrean and the Swiderian? I read the latter had willow leaf blades. Tomenable at Anthrogencia is pleased with the mtDNAwiki Report I wrote for him. I've sold about 14 so far. I offer mtDNAwiki Reports on this page. Check it out guys! It is interesting that the appearance of the BE genetics roughly coincides with the flooding of the persian gulf basin (http://people.rses.anu.edu.au/lambeck_k/pdf/171.pdf). An area that was relatively isolated by hyper-arid zones and mountains to the North. Suspected to be an inhabited area from possibly back to 100K years ago. http://www.jstor.org/stable/pdf/10.1086/657397.pdf. So a BE population homeland may have centered in the gulf region. With later exansion into the fertile crescent and Zargos . The map in this paper seems to overlap the gulf anyway. Related to the notes about Ust-Ishim and this paper and to help with my own ignorance. Noted that this is small segments and that I am in no way making a claim of relatedness, or validity of the tools. But I see that this claim is often made as it is in this paper. "Not represented in populations today, used to date Neanderthal admixture." While it may just be a function of the segments that were tested and chance why is it assumed that Ust-Ishim is not represented in populations today? yes 1 cM segments are short, but 800.5 cM for such an old sample seems like a lot to me. I found a young EEF lineage shared exclusively between eastern Europe and SC Asia (including India and other Indo-Aryans). "No it does not fly because WHG isn’t from the solutrean, that’s your misconception"
Why is WHG not from Solutrean? But indeed it won't fly because it would require that other Ice Age Europeans than El_Miron and WHG als would show an affinity to the Middle East and they don't - not even GoyetQ116! - as the D-stats in Fu et al show. But that limitation makes the case for an unsampled population. Mind you the fact that GoyetQ116 does not show that affinity tells us that the affinity must be related to the WHG part of El Miron. Ust'Ishim came from permafrost and has an exceptionally well preserved DNA. That may explain it. The odd thing with placing BE's in Arabia is that either the split between them and the rest of the Eurasians needs to have occurred there, or the expanding HG's out of Africa that formed the paleolithic Eurasians must have managed to do so without getting in touch with BE's. Regarding the BE estimates in the paper: "Basal Eurasian ancestry is highest in the Near East, with estimates as high as 66% in Epipaleolithic Natufian individuals from the Levant ∼12–9.8 ka, and 44% in a Mesolithic individual from Iran from ∼9.1 to 8.6 ka (i.e., Hotu)." At first I thought these were new estimates, confirming what some (incl. Davidski) have here been saying (Natufians being the most basal). But they actually refer to Lazaridis et al 2016. So, they must have switched up the numbers as Lazaridis has them the other way around. Yes, the details are of course very blurry, and we'll need further samples to really know if and how much Paleo Europeans contributed to WHG, where and when. But I think that the general picture from the data is quite constrained to change too much. It could be a matter of bad luck. But again this is about probabilities rather than about what's just possible. Imagine that we know about this shared ancestry between West Asians and LUP/Mesolithic Europeans, so we'd have 2 competing hypotheses: Either a West Asian population moved to Europe or a European population moved to West Asia. And in principle (ignoring everything else), we could give each one 50/50 chances. So then we try to get genomes from 40-25 Kya to see which one is correct. But due to climatic conditions (among other factors), we manage to get 20+ samples from Europe and none from West Asia. And it turns out that none of the 20 samples from Europe from that period are WHG. Would that increase or rather dramatically decrease the chances of a European origin? I think the latter. Saying that the right samples have been missed by chance is going for the least likely scenario. - You'd need that missing population not just to colonize all of Europe, but to venture deep into West Asia (including Arabian peninsula) and North Africa. That's quite an expansion for a hidden population from Europe. - And on the other hand you'd need that those Basal Eurasians (unadmixed), who branched off from the rest of Eurasians some 70 Kya would be in West Asia since then and never ventured into Europe until some 9 Kya (and never to East Asia). Is that a plausible scenario? And where was Europe being populated (repeatedly) then, if West Asia was occupied by Basal Eurasians? In the first map, I would safely connected from Ust-Ishim to Oase, and probably to the Tianyuan. And shows areas of Basal Eurasian do people generally live? People lived in Palestine. On the second map why they did not join Sunghir and Central Europe? Scared of what? Anthropologically they belonged to a Brun-Prsedmost type. The third card I agree, the only EUR likely direction was from East to West. I am fascinated by the Basal Eurasians. Your observation is particularly interesting":Seems to me that Basal Eurasian admixture into the Levant is not older than the Kebaran. So are you suggesting that the Kebaran people are in fact the BE? That if we could get DNA on one of them we would find the pure BE DNA? These people seem to come out of nowhere, with no samples of them > 13,500 years ago. Where were they? "You'd need that missing population not just to colonize all of Europe, but to venture deep into West Asia (including Arabian peninsula) and North Africa. That's quite an expansion for a hidden population from Europe." 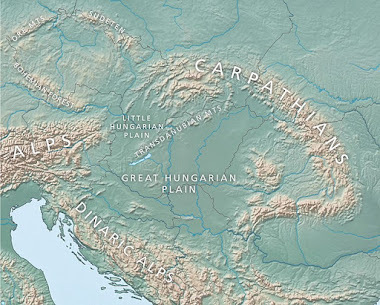 Europe during Pre- or Proto-Aurignacian had them, next to several others such as Oasis1. Then Phlegraean Eruption, end of Oasis1, the whole area cleared by that eruption is retaken later. That explains the migration to the Middle-East. "- And on the other hand you'd need that those Basal Eurasians (unadmixed), who branched off from the rest of Eurasians some 70 Kya would be in West Asia since then and never ventured into Europe until some 9 Kya (and never to East Asia). Is that a plausible scenario? And where was Europe being populated (repeatedly) then, if West Asia was occupied by Basal Eurasians?" But then you state that the Middle-East admixture is basically Basal Eurasian. However, in SI chapter 8 of Fu et al they already make clear there is no Basal Eurasian in pre-neolithic Europeans. But that's not all. All of the populations resurrecting from LGM went through a bottle-neck. But not in the Middle-East. So, if a migration from the Middle-East is the cause of WHG it had to be pre-LGM. But pre-LGM we don't see anything that matches. However, if we consider both el Miron and WHG an admixture of several pre-LGM pops, with WHG being GoyetQ116 + Gravettian + our assumed population + a tad ANE and El Miron GoyetQ116 + our assumed population we can account for a lot. Okay. But I was merely considering Solutrean a part of the mixture. @David, could be. I almost never want to assume they're holding anything back tho. @Alberto: So unless further samples really turn this around, it seems to me that migrations have clearly gone south to north. Or is there a different way of looking at the data already available? So at the moment we have: Villabruna and Bichon (almost simultaneous at 12,000 BCE / 11,700 BCE) and almost simultaneously Satsurblia cave sample and the Natufians. If we're having a migration from east of the Balkans, then you need a simultaneous migration such that BEu was just arriving in both Satsurblia and Natufians (and so highly likely all the land between them) at exactly the same time the ME HG was leaving for Europe. (I guess could be isolated Anatolian, but I believe that the idea is that this area was depopulated in the late Upper Paleolithic? In any case, the Levant and Mesopotamia seem out). (In a general sense, of course we have fairly plentiful examples of geneflow going north (cooler) ->south (warmer) through history as well. SE Asia obviously has ancestry out of China, the IAM people from North Africa don't really exist any more, India (one way or another), East Africa, multiple migrations into North America by waves of Native Americans with varying levels of relatedness to present day Siberians, modern day Caucasians are certainly far less BEu, or at any rate, more affected by EHG, than the ancient Caucasus of Satsurblia and Kotias, etc. The Balkans to the Levant is a mere hop and a skip away by comparison...)). Looking at the eastern part of North Eurasia, we have MA-1 already there before the LGM. Hmmm... I wonder about that. How much do we know about what happened there? We know that Native Americans of some sort existed likely in Beringia, but I wonder how much they had been marginalised by Devil's Gate types (who evolved god knows where) in much of the rest of Eastern Asia before that...? (Perhaps by multiple layers of ANE->East Asia migration until little autosomal trace was left). (The paper on Baikal Hunter Gatherers may be an interesting game changer here "Our genome data (~1X) reveal that Baikal Hunter-Gatherers (BHG) are an uncharacterized genetically homogeneous branch of Inner Asian hunter-gatherers, displaying highest shared genetic drift with present-day East Asians. Targeted sampling strategies coupled to excellent biomolecule preservation has permitted the generation of an advantageous sample size dataset (n = 31), rendering possible to estimate allele frequencies within these groups, thereby optimizing population tests. BHG model as an excellent proxy for an Inner Asian source population admixing into the late Bronze Age Andronovo groups, becoming Iron Age steppe nomads." https://twitter.com/amwkim/status/848304278607249408 It may turn out a major migration of BHG to the south really did hit during the LGM.). Though I'd also say my toy model does imply frequent population crashes and extinctions as the consequence for populations which do not successfully migrate... Where are the Vestonice cluster? Quite possibly nowhere really. "Though I'd also say my toy model does imply frequent population crashes and extinctions as the consequence for populations which do not successfully migrate... Where are the Vestonice cluster? Quite possibly nowhere really." But we see that populations that completely vanish from the radar resurrect 15.000 year later: GoyetQ116 -> Magdalenians. That doesn't feel like extinctions were the norm. Seems like you need a functional trifurcation of (Tianyuan)(West Eurasian)(Other Han Related ancestry) lineages to get the model. The later Villabruna cluster members are getting some ancestry X which makes them closer to Han... but not closer to Tianyuan, compared to previous UP people. So this cannot be ancestry which shared any significant degree of drift with the Tianyuan clade relative to what the rest of the West Eurasian (K14 related) clade had. But at the same time, X cannot share any drift with West Eurasian, or Han would be closer to K14, etc. than Tianyuan (which is not the case). So seems like East Eurasians have to be descended from at least 2 deeply diverged lineages, (one of which is Tianyuan related), which are effectively part of a trifurcation with West Eurasian (don't get too hung up on the labels). Oase1 and Ust-Ishim show us that such populations existed, effectively at a trifurcation (some do show evidence that they shallowly can be fit on the West Eurasian / East Eurasian parts of a tree, but they are effectively trifurcated in how weak the stats are). Assuming this works, at some point you'll find a population that shares almost no more ancestry with Tianyuan than with K14... But lots more ancestry with Bichon than Villabruna and K14 and lots more ancestry with Han than Tianyuan. Lee beat me to the article, but, yes, that is also how I see things unfolding. I wonder, though, if there were actually two basal populations in the past: either with one being more basal to the other OR both being divergent clades of the same early split. At any rate, I envision one as an early back-to-Africa, E-carrying lineage and somewhat important for Natufians. The other I see as having been more important for early Neolithic Iran, Boncuklu, and (unsampled) northern Mesopotamia. Predominantly Y lineage CF. Do formal methods reject such scenario(s)? They have maps under EUR refers to quite different sizes. The third map EUR they have EHG. Karelia is EHG. And the influence was clearly from East to West, and not back. A third card can not be interpreted otherwise. No arrows from where they portrayed EUR to the place where they portrayed Karelia was not. There was an arrow in the opposite direction. In General, the map certainly full of noodles, in order to forge the concept they have even portrayed Europe and Karelia with one color. EHG and WHG come from different sources. Looks like the Guanche genomes are available. When do you think you'll be able to add them to your datasheets? Will have to wait for the Early Neolithic Moroccans to come in, though. Should be interesting to run formal stats on those. Any possibility to make a pca with WHG-EHG-Basal Eurasian-Neaderthal-Denisova- Chimpanzee? "The later Villabruna cluster members are getting some ancestry X which makes them closer to Han... but not closer to Tianyuan, compared to previous UP people." This people probably was closer to AG2. He walked to West trough Sunghir-like population. Rather than WHG being some odd pop that minimally mixes into Vestonice and ElMiron, it is more likely that Vestonice is closer to the branch WHG came from, so they share minimally more drift and ElMiron is probably mostly WHG. If you could possibly run them, I'd appreciate it. I find it pretty amusing that a site with the title Eurogenes is attempting to use y-chrom genetics to support the aryan invasion hypothesis. Here's my deal. I'm genetically western european. Politically I am neither repugnantcan or demoncrap, but lately more conservative...I informed myself about Killary's criminal activities, LOL. Philosophically, Spiritually I am advaitin/ pre-hindu. Education - I was a molecular biologist. I can GUARANTEE YOU and any uninformed reader that chronology is a big issue with your sample size and limited genetic data. Your conclusions in terms of migration, and definitely "invasion" are speculative at best, as you ignore the fact that there is no precedent for the culture/philosophy/religion of ancient India, and no evidence for it in western culture at any time. The idea that europeans brought Sanskrit, gimme a break. Vedic and pre-vedic culture was advanced when Sumerians were non-existant. "Vedic and pre-vedic culture was advanced when Sumerians were non-existant." Did they ride around on Unicorns? It's nice to hear that you're amused. But when you manage to find some time away from giggling and whatnot, you should change your nick to Clueless. At least then other people here would know what to expect when you decide to take up bandwidth with your comments. Obviously, the idea that DNA can track expansions of languages, and especially Indo-Iranian and Indo-Aryan, is taken very seriously by a lot of people, because it's supported by solid evidence and strong arguments. And if you want to challenge this idea, particularly in the case of Indo-Iranian, then you actually need to take some time to learn about the said evidence and arguments, and come up with coherent counter-arguments, and not just a few irreverent personal thoughts on the topic. For instance, how do you explain the close and relatively recent linguistic, Y-chromosome and genome-wide relationship between Indo-Aryans and Balto-Slavs? These groups, often classified by historical linguists as linguist sister clades, live many thousands of miles apart, yet they share the Y-DNA R1a(Z645+) mutation, which expanded across much of Eurasia during the Bronze Age, a time frame also associated with the expansion of Indo-European languages. So what do you say to that? Do you have a more plausible explanation for it than the expansions of the ancestors of both Balto-Slavs and Indo-Iranians from a common ancestral population in Eastern Europe, where, for instance, ancient DNA has shown the presence of the chain of mutations leading to Balto-Slavic- and Indo-Iranian-specific clades of R1a? Feel free to dazzle us with your scientific mind. Thank you as I had missed the massive difference in coverage. GedMatch abstracts that metric away. It looks like I will need to start working with the raw data. It may not result in better data but at least I will know the source of all errors (me). About Han, & picking up from months ago, the recent “Scandinavia” paper clears that up no ? You believe DE split in Africa? Unlikely to have been too deep inside Africa considering the absence of D there. As for the movements from Northeast Africa into the Levant----do you think they were coupled with SSA lineages, or, as I suggest, with a ghost lineage basal to other OOAs but "crown" in relation to SSA lineages? If the latter was, indeed, the case, Natufians and modern Bedouins probably get most of it in the Near East. Perhaps Harifians and pre/early Dynastic Egyptians as well. Also curious: Where do you place the AA urheimat? You would think Basal Eurasian had to be intrusive at some point in order to lack Neanderthal ancestry. I guess that movement was pretty old though. Can you get treemix to more or less capture this? Also Qiaomei Fu is a rockstar. But I've swapped TreeMix for qpGraph, because there's generally much less fiddling around. No I think DE is Eurasian, at face value at least. However, having a TMRCA of 63ky BP, it's not particularly relevant to Natufians and the LGM. So if DE back-migrated to Africa, E still grew and diversified in NE Africa (or wherever specifically). It seems the Nile region was a significantly densley settled refuge during the LGM, which then became depopulated during the Final Paleolithic, which is broadly when the Natufian industries, and their ~ E-M35 lineages appear. About AA - similarly I don't know that much about it, but the cladistic tree suggests a movement from E Africa also ? What I find more interesting is the origin of Semitic, the role of intrusive patriarchal highland J clans, and possible analogies/ lessons for Indo-Hittite. "So if DE back-migrated to Africa, E still grew and diversified in NE Africa"
Ok, this is my thinking exactly. So, no disagreement there. I'm just really curious about the autosomal nature of this possible back-migrant ancestry and its ultimate role in Natufians'/IAM pseudo-SSA shift. Based on my limited knowledge of prehistoric NA/Levant, it really does seem that in certain periods of late paleo and mesolithic, Egypt was a densely populated region and a genetic source for outward migrations---into the Levant and westward into the Maghreb. e.g. Fayuum culture has ties to Harifians; Motif similarities between Iberomaurisian, Egyptian and Levantine industries, etc. The 'Akkadian' branch seems straightforward. Initially migrated northward, hybridized with local ANF-CHG people and then followed the Tigris/Euphrates down to the Gulf. As for south Semitic, I suppose there was also a mixing stage in the Levantine hinterland during which they acquired J and carried it south through the Hijaz(and ultimately to the Horn). "Indeed, they seem to suggest that post-Basal Eurasian Near Eastern populations took shape not as a result of the expansion of Basal Eurasians across the Near East, but rather due the migration of northern foragers (labeled EUR on the map) from Eastern Europe to the Near East." Regardless of the arrows in that picture (which clearly does not represent any complete picture), the authors were careful not to make such a claim/implication in the text.
" In the Caucasus, ∼13–10 000-year-old individuals (i.e., Satsurblia and Kotias) show a close relationship to ancient individuals in West Eurasia, but they also possess the Basal Eurasian ancestry observed in populations from Europe and the Near East [13, 27, 28] (Figure 2B). Basal Eurasian ancestry is highest in the Near East, with estimates as high as 66% in Epipaleolithic Natufian individuals from the Levant ∼12–9.8 ka, and 44% in a Mesolithic individual from Iran from ∼9.1 to 8.6 ka (i.e., Hotu) . Further sampling will help to determine whether the gene flow between populations in the AMC began during this time period or extends back into the AMB. 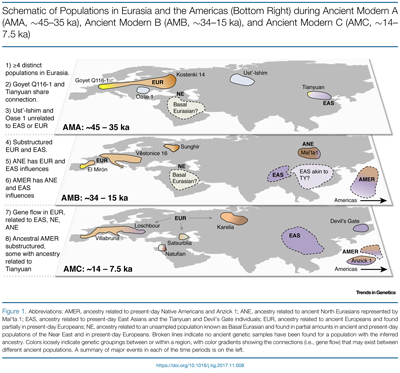 Regardless of the timing of gene flow between East and West Eurasia, some amount of either Near Eastern ancestry, Asian ancestry, or both has been observed in all West Eurasians sampled from the AMC." "Specimens from the AMB that have been sequenced to date show that by this time modern humans in West and East Eurasia are similar to either Europeans or to Asians. There is also evidence of population structure in both ancient Europeans and Asians, as well as a notable mixture of European- and Asian-like ancestry in North Eurasia." Still, a good read, especially for a lay-person like me :) thanks. The y dna E could have emerged in Africa. Even E M35 could be present in Mesolithic NE Africa. But some subclades of E-M35 are very problematic to link to Africa. Mathieson in his recent revision qualified one of Levant Neolithic samples as a pre-E-M78. Genetiker simply called it M78. I have serious doubts that we will see any M78 in Mesolithic Egypt older than Levant N. And keep in mind that this M78 is crucial for PAA. Imho It is impossible to place E homeland in Horn of Africa. It is probably from North Africa. Because we have numerous hunter's y dna from South of equator. And none of them is E ! What about Ust Ushim and Oase being from South Asia? Upper Paleolithic South Asia could be similar to them. Yeah, I definitely place things in a comfortable northeastern position, but wouldn't even be surprised if Egypt itself was an important early diversification zone(probably more so in Upper Egypt, if I had to guess). Btw, remember the pharaoh with E1b1a? Haplogroup noobs automatically assume ancestry south of the sixth cataract based on frequency, but no reason to think he wasn't your average local. Also, the "tropical" traits associated with ancient Egyptians needn't at all be attributed to SSA. Think Papuans, Agta, Onge, etc. Just a preservation of some primordial traits suitable to that sort of environment on the part of their basal-most ancestry. I would imagine, of course, they decreased somewhat after a PPNB/C(? )-like influx(perhaps also packing more CHG) from the ME swept across NA. We need to thoroughly scour Egypt for ancient DNA, imo. Nile, Fayyum, and all the oases in between. @Rob, could have something to do with EHG, as EHG also show the same pattern of differences in relatedness to Han vs Tianyuan, but not due to ANE, as Fu seems pretty sure the patterns within the Villabruna group in relatedness to Native Americans vs East Asians are distinct. @Davidski, thanks, both of those models *work*, with the model where X is shallowly on the Villabruna side of the tree and makes up most ancestry in Han working slightly better. As a double check to see if anything is up with Han, would you mind running these? (If Lapita_Tonga isn't doable then Lapita_Vanutu, but if neither are doable, don't worry. This is just to check if adna produces different results than a modern East Asian group with higher heterozygosity, using the only ancient East Asian adna we have). 1 (X on the East side): Vil Han Tia Han, which I think should be equivalent to f3(Han;Tianyuan, Villabruna). Not sure how to interpret this. 2 (X on West side): Vil Han Vil Han, which is f2(Villabruna, Han). (f2 stats are basically such that f2(A,B) is equivalent to f4(A,B; A, B). See Ancient Admixture in Human History). I don't have the Lapita genomes in my current datasets. I'll have to add them next time I update things. I didn't quite follow your reasoning, so it's hard to answer. I think that admixture from WHG is quite easy to detect in other populations. We have it clearly there in El Miron, but not in any of the pre-25 kya samples. All of the populations resurrecting from LGM went through a bottle-neck. But not in the Middle-East. So, if a migration from the Middle-East is the cause of WHG it had to be pre-LGM. But pre-LGM we don't see anything that matches. 25-22K YBP is indeed pre-LGM. We don't have one single sample between 25-20K YBP (unless I missed it). Though here I think we're a bit off with our timings. If El Miron (20K YBP) had some 30% WHG admixture (and assuming that WHG one way or another came from the east), that means that WHG entered Europe at 22K YBP. And none of the pre-25K YBP samples show this admixture. So I'm talking about 22-25K YBP. The question is: Where was WHG 30K YBP? And where was BEu at that same time? There could be a synchronization between the arrival of BEu to the Near East and the arrival of WHG to Europe, why not? One population pushing out another. From the Balkans we have a sample from Romania and then one from Italy. It could be that Bulgaria or Greece had WHG already at 25-30K YBP, but where would they come from? As I said, if we imagine a pure BEu population in the Near East since 70K to 15K YBP, we have a big problem explaining why this population didn't appear anywhere in Europe (including Eastern Europe, through the Caucasus). We'd have to argue that all Paleo Europeans came from Central Asia, and ultimately from South Asia in various waves, always avoiding those static Basal Eurasians. @Alberto, if you assume that the Villabruna clade entered Europe 25-30kya and then hung out in SE Europe, until a later expansion, then yeah, I think those objections I raised on timing don't stand. Where they do stand is for a late UP entry of Villabruna clade directly from ME (rather than Villabruna clade->ME). I don't think some degree of population isolation to allow for separate VB clade in SE Europe (which later influences ME) is particularly difficult in SE Europe - otherwise GoyetQ-116-1 ancestry isolation in SW Europe would be difficult. Obviously you have a lot of isolated demes in Eurasia at this point! (No samples from Romania in Fu et al 2017 - what Upper Paleolithic EUR group pre-20kya sample are you referring to?). Siberian Ust'-Ishim and European Oase1 had haplogroup K2a* (pre-NO). Tianyuan probably had haplogroup (pre-)NO. Here probably they had a small Denisovan admixture increasing to the East. Here, all of the Paleolithic Europeans got their admixture. However, the carriers of haplogroup R had no admixes Ust'-Ishim nor Denisovan admixes. Their direct unmixed descendants is EHG, while the ancestors of Villabruna (R1b, Epigravettian) and Loschbur (WHG) is the effects of mixing with Ust-Ishim (Western Siberia), Sunghirian (Eastern Europe) and Gravettian (Central Europe), which prevailed quantitatively. The line of reasoning is this: We know WHG went through a bottleneck because we can see this in Loschbour and La Brana. We can also reasonably assume that was due to the LGM. We can reasonably assume the Mid.East didn't because we can see it in Hota IIRC. If there was admixture between an Middle-Eastern population and the LGM populations it would be visible in the Heterozygosity. I recall reading somewhere it isn't. Iain Mathieson said the following on twitter w.r.t. the link between Anatolian and Iron Gates HG. "I mean the evidence is D(Mbuti, Anatolia_Neolithic, WHG, Iron_Gates_HG)=+7 but I don't know what the direction is." Are the Iron Gates HG already available? If so, could you do D(Mbuti, Natufian, WHG, Iron_Gates_HG)? "But again this is about probabilities rather than about what's just possible. Imagine that we know about this shared ancestry between West Asians and LUP/Mesolithic Europeans, so we'd have 2 competing hypotheses: Either a West Asian population moved to Europe or a European population moved to West Asia. And in principle (ignoring everything else), we could give each one 50/50 chances." There's a 3rd logical possibility - that a population from a third region A moved to both region B and region C and then later (or simultaneously) disappeared from region A (or hasn't been found yet). Isn't there another possibility here also - say population A developed genes needed to survive in colder climates e.g. more efficient processing of iodine, and those genes provided a competitive edge further south or nearer a coastline where there was more base iodine in the food then maybe it didn't require a mass migration? possible contenders for currently missing but significant populations might be 1) small nomadic steppe forager groups who despite having a very wide range left very little physical trace or maybe 2) wetlands foragers with by definition a very limited range geographically around lakes/seas and whose traces may be mostly under water. "The paper on Baikal Hunter Gatherers may be an interesting game changer here"
The Neolithic transition in west Eurasia occurred in two main steps: the gradual development of sedentism and plant cultivation in the Near East and the subsequent spread of Neolithic cultures into the Aegean and across Europe after 7000 cal BCE. Here, we use published ancient genomes to investigate gene flow events in west Eurasia during the Neolithic transition. We confirm that the Early Neolithic central Anatolians in the ninth millennium BCE were probably descendants of local hunter–gatherers, rather than immigrants from the Levant or Iran. We further study the emergence of post-7000 cal BCE north Aegean Neolithic communities. Although Aegean farmers have frequently been assumed to be colonists originating from either central Anatolia or from the Levant, our findings raise alternative possibilities: north Aegean Neolithic populations may have been the product of multiple westward migrations, including south Anatolian emigrants, or they may have been descendants of local Aegean Mesolithic groups who adopted farming. These scenarios are consistent with the diversity of material cultures among Aegean Neolithic communities and the inheritance of local forager know-how. The demographic and cultural dynamics behind the earliest spread of Neolithic culture in the Aegean could therefore be distinct from the subsequent Neolithization of mainland Europe. No samples from Romania in Fu et al 2017 - what Upper Paleolithic EUR group pre-20kya sample are you referring to? Didn't take a closer look at the paper now to check what they say about them exactly, but I would remember if they were some kind of proto-WHG? And 4 samples from Italy (assuming that with lower sea levels Italy was closer to the Balkans, though not sure if the Adriatic would still be a big barrier for them), between 34.000 to 27.000 cal. BP. So not proto-VB, but not part of the common Vestonice cluster. Adds weight that there is a population structure divide here, weakens idea that presence of Vestonice cluster in Italy, Vestonice, NW Europe precludes further structure in SE Europe (though not clear how much either of those actual samples could be ancestral to Villabruna!). @@Unknown You're an immature Indian nationalist masquerading as a Western European to lend credibility to your foolish claims. Yet, anyone with a brain cell can see through your ruse. Now be gone! Dave, I was reviewing the "Basal-rich" scores in your Basal K7 test. What percentage of that component do you reckon is actually Basal Eurasian? I think I remember you saying about half of it is, which would bring the Natufians down to ~37% BE. Have you any thoughts on this in light of this review or other more recent evidence? I haven't revisited the issue. But yes, probably about half of the Basal-rich component is Basal Eurasian, although this may vary for different populations, due to the way that ADMIXTURE works, so it's very difficult to be precise. From memory, Matt looked at this issue in more detail than me, so he might be able to give you more insights. @Davidski Were Neolithic Iranians really 50% Basal? @Mike, I actually can't remember what conclusions we came to if any, might be worth looking at old threads. I had an idea for estimating it prompted by your post: Use the component BRK7 Fst with Principal Coordinates Analysis to create a dimensional space representing the distance between components, then find a position which correlates to the Basal-Rich component level in populations, and is equidistant from the other Eurasian components, relative to distance from Africa. The defining characteristic of BEu is phylogenetic equidistance (relative to overall drift) from all other populations of Eurasia. But I'm not so sure how worth doing this would be. If Fu's paper is talking about some admixture from a population X into Villabruna clade compared with UP Europeans, making Villabruna closer to Han without making it closer to Tianyuan, then I'd guess that makes it harder to distinguish with the dimensions in BRK7 between the Basal-rich component having more of that vs more actual Basal Eurasian... Still might be worth a try though, as a simple model. @Mike, I've tried to do a few basic things on the Fst table for the components for Basal Rich K7 to work out how much BEu is in the Basal Rich component. Put up a few screenshots on Imgur if you want to follow along. Other solutions can be found to "make" Basal-rich from the simulated Basal populations, but these would all send the simulated "UHG" further away from Villabruna / ANE. If you have very high levels of BEu in Basal-rich, using these simulations, then the UHG has to have extremely high levels of drift away from other Eurasians and to be much more "West Eurasian" than VB or ANE is, in order to compensate. A low drift Basal population and a relatively typical West Eurasian population seems more intuitive. Not sure if this method is all totally sound, but that's my best guess for Basal-rich component based purely on the component Fst and fitting using Fst PCoA - 20% Basal and 80% of UHG. That's extremely low compared to the lit though, I know. Poss some populations with extreme levels of BEu beyond Anatolia_Neolithic are not so well captured? Anatolia_Neolithic estimated with about 25% Basal Eurasian in Lazaridis 2016. Wow, you went above and beyond there, mate! Very much appreciate the effort. That analysis makes a lot of sense to me; I hope to see it confirmed or disconfirmed in the near future with the aDNA holy grail: a "pure" Basal Eurasian sample. I'd love to see their Basal and SSA levels. I don't think this topology is fully correct. There are clearly more differences between than just more WHG related admixture in Anatolia. Iran and CHG have much more ENA admixture (of few different types probably) which isn't shown here. >Consider Kostenki14, GoyetQ116 and Oase1. They are highly different, even if K14 and GoyetQ116 are clearly from the same stock while Oase1 isn't. This might give an indication that ice age people were highly diverse. Oase1/Ust'-Ishim seem to be Oceanian-like. Oase has elevated Neanderthal admixture which makes it seem more divergent than it actually is. Goyet/Kostenki/Vestonice/Sunghir aren't that different. Kostenki is probaly least differentiated out of the four, Goyet has Tianyuan related admixture and Vestonice is closest to Villlabruna Cluster. Sungir is inbetween Kostenki14 and Vestonice. Vestonice probably had more of drift towards WHG than actual WHG admixture. I doubt WHG was fully formed at that time. >And then we see a new population (WHG) colonizing Europe. From where? Not from Europe itself (since we have preceding samples from across the continent) and not from Siberia (we have samples too). Probably from the Middle East. Middle Eastern UHG most likely had a distant common ancestor with it. Another option is that Vestonice-like populations evolved into WHG through drift but it's probably more complex than that. >Poss some populations with extreme levels of BEu beyond Anatolia_Neolithic are not so well captured? Neolithic Moroccans from Fregel seem to be very highly basal. Could you test them. It's also possible that "Basal Eurasians" where actually a very early mixed population. That would greatly complicate any admixture estimates. Those Yemeni islanders look a bit like Sri Lankans. I wonder about their ASI levels. I agree with Mike, very nice work mate! Always enjoy reading your comments and analyses. Appropos, could you tell me how you did the regression of the Global10 samples to Davids new PCA? That paper mentioned in the linked blog article got released with a different title, and the samples are freely available. Would be great if David could analyse them. @Eren and Mike, cheers guys. In hindsight I think I may have overengineered it a little bit and the 20% number is probably a bit overprecise. (I won't tl;dr but there are some questions about the higher dimensions capturing the Basal-rich component's specific drift, and how much of that should come from BEu or the HG side). To intersect all the right points, Basal-rich can't be more than 20-40% Basal Eurasian (anything more would mean that the HG side of Basal-rich would have to be drastically more heavily drifted than Villabruna component or ANE component, for one!) and Basal Eurasian has to have relatively low drift in the main dimension that separate Eurasians from African. 2) use a simple matching formula (countif) to match the IDs between the two sheets (Overlap was about 220 rows, including population averages. It would probably be higher if I'd used a Global10 sheet with modern day individual samples as rows rather than population averages only, and that might be marginally more of an accurate projection, as there could be a gain from having a bit more data to capture how dimensions between the two sheets covary). 6) take the output regression coefficients and then build a spreadsheet where the input Global10 variables can be processed through the regression equation. This is the bit that's more complicated to explain, but the way I did this is to put all the regression data in a set of columns, then put the Global 10 data in the next columns, then another set of columns with formulas to run the regression. (So "=Ancient_67_PC1_Constant+(Global10PC1_to_Ancient_67_PC1_Coefficient*Global10PC1)+(M$5*$AK3)+(Global10PC2_to_Ancient_67_PC1_Coefficient*Global10PC2)+...."). If you know R, the efficient way (that I really should do) is probably not to bother with this just to write a script that does this (actually the whole process could be more efficiently done just as an R script!). @David - "Which part? But I've swapped TreeMix for qpGraph, because there's generally much less fiddling around." Does that make sense? I'm talking about the 8 points listed in figure 1. Wonder if you can replicate them in qpGraph or whatever. >aDNA holy grail: a "pure" Basal Eurasian sample. Morocco_IAM may be just that or nearly so. Thanks for the detailed explanation! I had gotten to step 5 myself earlier, but didn't really know what to do with that many coefficients. A bit complicated as you said, but your example definitely helped. re: "pop X" in Han, i suspect such a thing doesn't exist. it's likely just minor steppe/west asian ancestry in Han raising their affinity to WHG. @jparada, though that sort of structure (population shares reasonable amounts of drift with K14, GoyetQ-116,Vestonice16) should raise stats like D(Onge,Han;Vestonice16,Mbuti) / D(Onge,Han;Kostenki14,Mbuti), which if I recall correctly, is apparently not the case (basically 0). i was under the impression that Han is marginally closer to Europeans than Onge is, please correct me if i'm wrong on this. On Bichon vs. Vilabruna, if i recall correctly, Bichon is closer to later West Eurasians than Vilabruna is, too. @Matt - The stats could still be 0 if there was both East Eurasian and Basal Eurasian admixture balancing each other, no? Which is essentially what Fu found? I'm not sure if Bichon is closer to later West Eurasians than VB. You might have to look at the statistics in Lipson's latest paper for a hint. I don't think there's anything too consistent. @ryan, which stats are we talking about? Any UP Euro descended pop plus with East Eurasian+BEu flow should theoretically look different in relatedness to Ust Ishim. Some calculators suggest that Bichon seems to have additional minor ENA admixtures(southeast asian, oceanian) which may explain him showing more affinity to Han than Villabruna. That El Miron run is interesting. The North Sea coast may harbour an extra tad Magdalenian.